Bold rainbows, cute pastels, and endless glitter and fairy lights. The unicorn bedroom trend is unapologetically girly, and it’s one of the few bedroom trends that appeals to children of all ages. From babies and toddlers who are mesmerised by the explosion of colour, all the way up to teens who dream of having a cool nest that’s Instagram-worthy, unicorns are universally loved. There are so many grown-up ways to incorporate the unicorn trend into your home. Our unicorn wallpaper murals are an enchanting way to transform a dull spare room. Or for those who are fantasists at heart, they make the perfect feature in a magical master. Want to sprinkle some rainbow dust onto your interior project? Here are 9 unicorn bedroom ideas from Pinterest that will blow your mind. 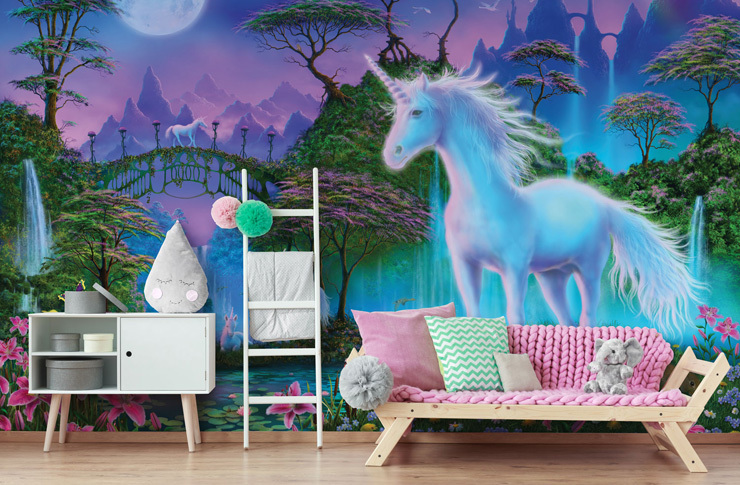 This spectacular Unicorn Bridge wallpaper is a show-stopper for a children’s bedroom, or a grown-up bedroom with vast wall space and great natural lighting. Rooms with high ceilings will benefit from a larger surface area, rendering the mural more imposing and impressive when you walk in. As seen in this fabulous unicorn bedroom, white walls create a bold contrast with the mural, and simple furniture styles create a light, airy and open space. It’s all about clean lines and fuss-free décor, so install ample storage to keep the room free from personal clutter. Princesses and unicorns go hand in hand, and bed canopies are a great way of making a girl feel like royalty in her own room. Traditionally, bed canopies are made of chintz, silk, velvet or tapestry. But for the rainbow-coloured variety (and for affordable bedroom design), sheer fabrics like tulle work best. They’re incredibly lightweight to work with. For rectangular canopies that cover the whole bed, you can simply hang the fabric from the ceiling. Or for a round canopy, add a hoola hoop to form the shape. Decorate with pretty princess wallpaper, or keep the design clean and simple with classic white walls. Not all unicorn décor needs to be overwhelmingly pink. If you want your child’s bedroom to be more gender-neutral, or you just prefer the minimalist approach, tone it down with a few nearly-white pastel hues. This bedroom design will slot right into a Scandinavian home where off-white walls rule and ‘clutter’ has been carefully selected to match the rest of the room. Minimalism is an enduring trend. And simple wall colours (like our Polygon Pastel mural) are the perfect canvas for all things mythical, whilst still keeping the look uniformly clean. Talking of minimalism, this beautiful bedroom brings us the exact opposite. It’s unashamedly busy – yet it doesn’t feel muddled or chaotic in any way. The coordination of colours and thoughtfully selected toys bring a surprising sense of calm. For kids who adore the colour pink and dream about fairy tale creatures in their sleep, this is the ultimate hangout. Marble is one of the major trends of 2019, and it manifests itself in many different forms. From expensive Carrera marble surfaces and marble wallpaper to small décor items, the scope is endless. When combined with the unicorn trend, colour is key. Our Pink and Purple Marble mural is a match made in heaven for this beautiful bedding. Or to create a crisp contrast, opt for all-white interiors – walls, floors, furniture – white everything. Then cosy it up with a textured rug and some plush cushions and throws. We think this bedroom is perfect for teenagers who are inspired by interior accounts seen on social media. Create some novelty features with a unicorn crown bed canopy or some adorable 3D wall art. This really adds a whole other dimension to your bedroom design. Artificial silk flowers and unicorn horns are great props to work with…..and with a little inspiration from Pinterest, you’ll find plenty of DIY projects to keep you busy. Keep walls simple to let the three-dimensional pieces shine, or opt for a watercolour effect wallpaper that adds drama without stealing the show. Kids growing up fast? Muted bedrooms like this one offer so much flexibility, so you can adapt and change the style over the years. Choosing something like grey wallpaper or other neutral shades gives you a blank canvas. Meaning you can swap bunting for books and unicorn teddies for cool cushions as they transition into their teens. Keep it tonal with soft pastels and washed out hues that add just a blush of colour. If there’s one thing that unicorns are always intrinsically linked to, it’s the colours of the rainbow. Bedrooms like this one are a way for unicorn fans to enjoy their favourite mythical creature in a more refined way. In big open plan apartments, rainbow or tie dye bedding can be a stunning contrast with wooden floors or exposed brick walls. Or for something a bit more ‘out there’, our Purple Paint Effect wallpaper is ideal. This is the master bedrooms of all master bedrooms. If you want to incorporate the unicorn trend in a grown-up way, mix beautiful florals with sophisticated colour schemes such as black, cream or grey. Ditch the pink walls and fairy lights, and throw in some French nightstands and the most luxurious candles you can get your hands on. For the ultimate feminine touch, choose a rose wallpaper or add some preserved boxed roses from brands like Fleurs de Paris – they’re pricey but they’re worth the investment as they last a whole year! Which is your favourite unicorn bedroom idea? Tell us the one you’d like to recreate in the comments below! Or if there’s another interior trend you’re swooning over at the moment, let us know – we’d love to hear all about it.